Satellite imagery shows a well formed circulation south of the Cape Verde Islands with good upper outflow aloft. There is a good chance for further strengthening into a hurricane over the next few days. 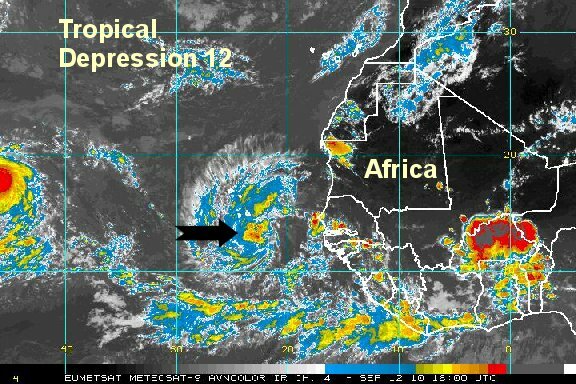 As of 2 pm edt / ast tropical depression 12 was centered near 13.1° N / 22.7° W or about 190 miles southeast of the southern Cape Verde Islands. Top sustained winds are estimated at 35 mph (NHC 35 mph 2 pm advisory). Movement is west northwest 14 mph Pressure estimated at 1006 mb. Forecast models have been taking this tropical system northwest into the open Atlantic for many days now. 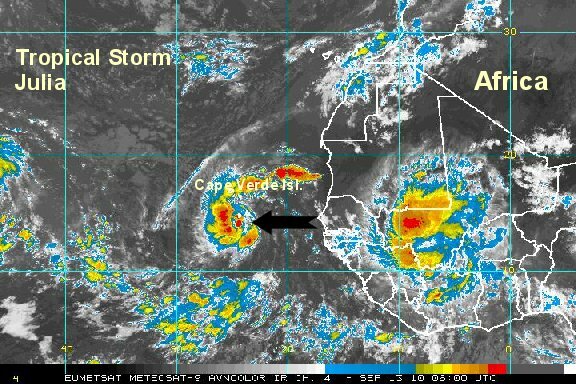 Tropical storm Julia is near the Cape Verde Islands. Sal, in the Cape Verde Islands, has reported winds of 20-25 mph with thunderstorms. As of 7 am edt / ast tropical storm Julia was centered near 14.5° N / 24.7° W or near the southern Cape Verde Islands. Top sustained winds are estimated at 40 mph (NHC 40 mph 5 am advisory). Movement is west northwest 13 mph Pressure estimated at 1004 mb. Forecast models are taking Julia into the open Atlantic well east of Bermuda. A few models stall it in the open Atlantic several days for now. It is not a concern at this time. Julia is slowly moving toward the open Atlantic Ocean. At this time it is expected to strengthen, but not pose problems to land. As of 8 pm edt / ast tropical storm Julia was centered near 15.3° N / 27.7° W or near the southern Cape Verde Islands. Top sustained winds are estimated at 50 mph (NHC 50 mph 8 pm advisory). Movement is west northwest 13 mph Pressure estimated at 1000 mb. Officially Julia is a hurricane. We don't think so quite yet. It appears that a little dry air may may been taken as an eye forming. It does not look like an eye has formed yet. Because of this, we still think that Julia is still a little below hurricane strength. 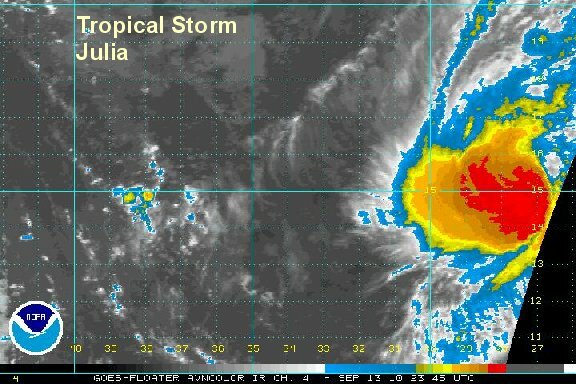 As of 7 am edt / ast Julia was centered near 16.2° N / 29.2° W or about 340 miles west of the Cape Verde Islands. Top sustained winds are estimated at 65 mph (NHC 75 mph 5 am advisory). Movement is west northwest 12 mph Pressure estimated at 987 mb. 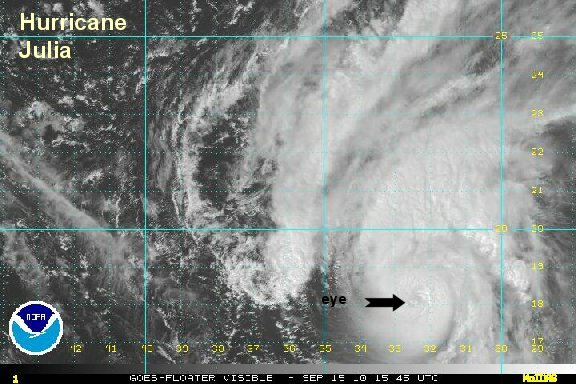 A bona fide eye did make a brief appearance a few hours ago, but has been hidden by clouds again. Julia is strengthening, but is of little concern to anyone at this time. As of 2 pm edt / ast hurricane Julia was centered near 16.3° N / 29.5° W or about 365 miles west of the Cape Verde Islands. Top sustained winds are estimated at 80 mph (NHC 85 mph 11 am advisory). Movement is west northwest 10 mph Pressure estimated at 984 mb. Forecast models are taking Julia into the open Atlantic well east of Bermuda. It is not a concern at this time. 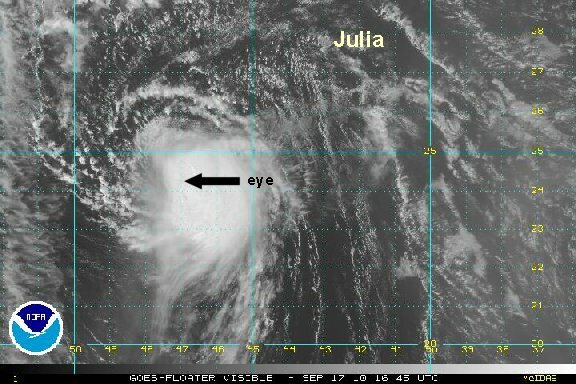 Julia had an impressive satellite presentation several hours ago. More recently the eye has clouded over and the cloud tops have warmed in the eyewall. Beacause of this, we think Julia is weaker than the previous advisory. Julia seems to have maxed out in strength (for now). 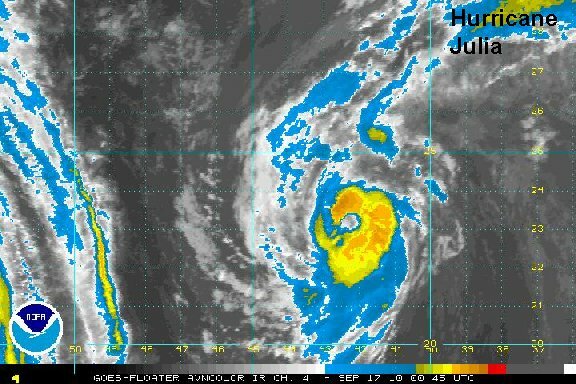 As of 7 am edt / ast hurricane Julia was centered near 17.7° N / 31.8° W or about 550 miles west of the Cape Verde Islands. Top sustained winds are estimated at 125 mph (NHC 135 mph 5 am advisory). Movement is northwest 10 mph Pressure estimated at 950 mb. 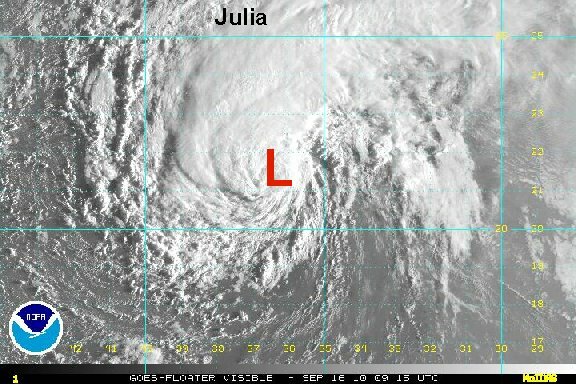 Julia looks slightly stronger than earlier this morning. The eyewall still in not symmetrical although clouds cooling is being noticed again. As of 1 pm edt / ast hurricane Julia was centered near 18.3° N / 32.8° W or about 600 miles west northwest of the Cape Verde Islands. Top sustained winds are estimated at 130 mph (NHC 135 mph 11 am advisory). Movement is northwest 15 mph Pressure estimated at 950 mb. 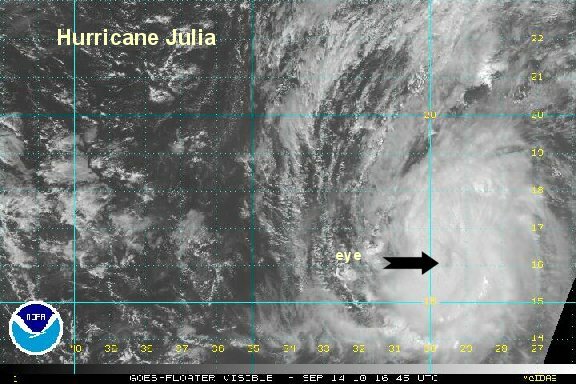 Julia's satellite appearance looks much less impressive than earlier today. The eyewall is ragged and broken. We believe the strength is now lower than the hurricane center's 5 pm estimate. In fact we have it just below cat 3. It also is apparent that Julia is moving north northwest. As of 8 pm edt / ast hurricane Julia was centered near 19.8° N / 33.4° W or about 675 miles west northwest of the Cape Verde Islands. Top sustained winds are estimated at 110 mph (NHC 125 mph 5 pm advisory). Movement is north northwest 17 mph Pressure estimated at 953 mb by the hurricane center. Julia's structure continues to degrade. Once again our wind estimate is considerably below the hurricane center's estimate, although they have taken winds down also. Southerly winds aloft are shearing Julia and it may not be long before it's no longer a hurricane. As of 7 am edt / ast hurricane Julia was centered near 21.5° N / 36.7° W or about 900 miles west northwest of the Cape Verde Islands. Top sustained winds are estimated at 90 mph (NHC 105 mph 5 am advisory). Movement is northwest 18 mph Pressure estimated at 970 mb by the hurricane center. Julia still looks ragged looking. There is still an eye, but it is broken. Overall, very little change to comment on since this mornings update. 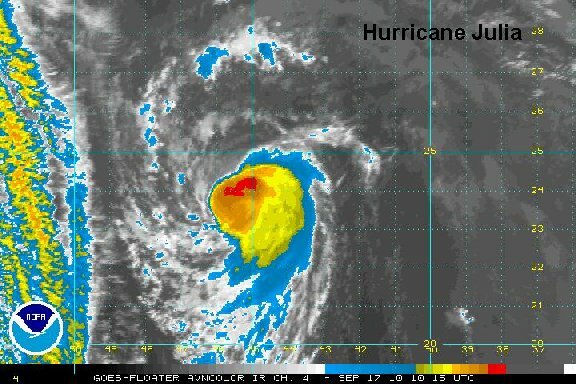 As of 2 pm edt / ast hurricane Julia was centered near 23.0° N / 39.0° W or about 1235 miles southwest of the Azores. Top sustained winds are estimated at 90 mph (NHC 100 mph - 11 am advisory). Movement is northwest 25 mph Pressure estimated at 971 mb by the hurricane center. It looks like Julia may be a little stronger, but we are holding off with increasing the winds. 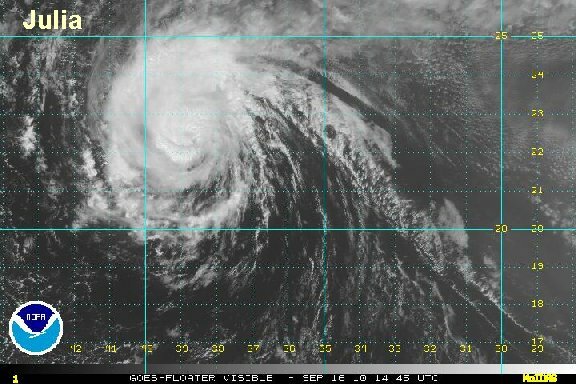 Julia is a small hurricane - about 5 times smaller than Igor. Small hurricanes can change strength quickly. The eye presentation looks much better defined compared to most of the day on Thursday. As of 10 pm edt / ast hurricane Julia was centered near 23.3° N / 42.4° W or about 1300 miles southwest of the Azores. Top sustained winds are estimated at 90 mph (NHC 85 mph - 5 pm advisory). Movement is west northwest 25 mph Pressure estimated at 981 mb by the hurricane center. 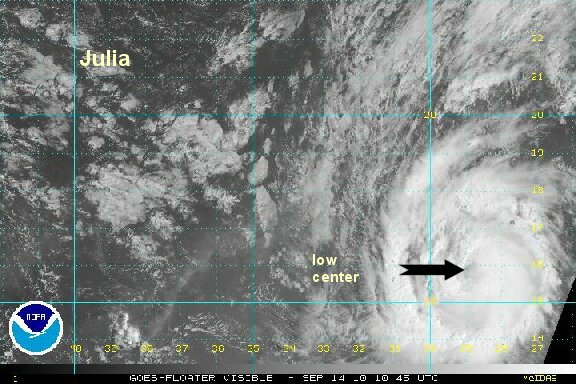 Julia's satellite appearance has degraded over the past few hours. The eye is not discenrable as it looks like outflow from Igor to the west is shearing it. It appears to be only a minimal hurricane at this time. 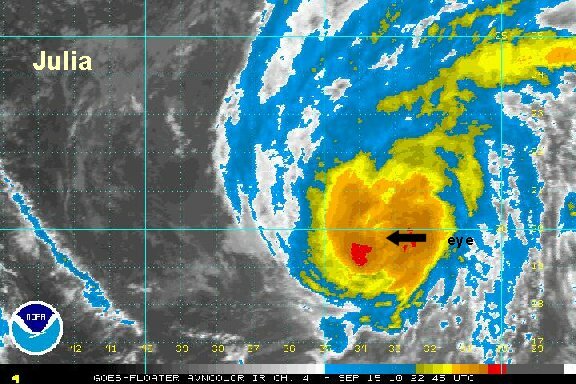 As of 7 am edt / ast hurricane Julia was centered near 23.8° N / 45.4° W or about 1485 miles southwest of the Azores. Top sustained winds are estimated at 75 mph (NHC 80 mph - 5 am advisory). Movement is west northwest 24 mph Pressure estimated at 981 mb by the hurricane center. 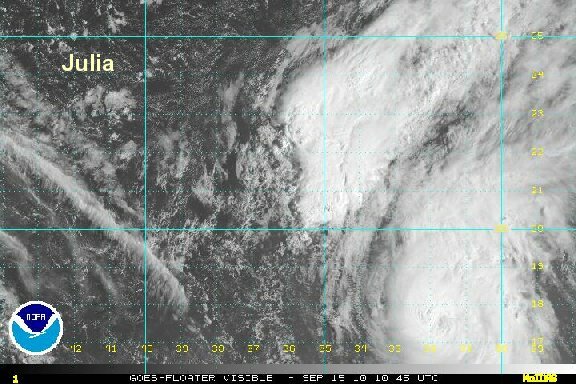 Julia is barely hanging onto hurricane strength as it is being sheared by winds from Igor to the west. It poses no threat to land. This will be our last update on Julia as it is slowly weakening and not a concern. As of 1 pm edt / ast hurricane Julia was centered near 24.4° N / 47.0° W or about 1525 miles southwest of the Azores. Top sustained winds are estimated at 75 mph (NHC 85 mph - 11 am advisory). Movement is west northwest 20 mph Pressure estimated at 981 mb by the hurricane center. Forecast models are taking Julia into the open Atlantic well east of Bermuda. It is not a concern.